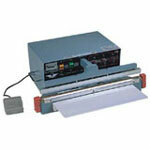 Automatic heat sealers are used for the rapid sealing of plastic bags. The heat sealing unit closes automatically at a rate set by the operator. 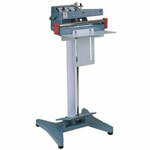 This provides greater efficiency by allowing faster operation with the user having both hands free to handle product. 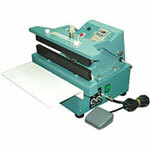 Automatic heat sealers are generally used for larger width bags. The bag should be 2 inches smaller than the seal width of the sealer. 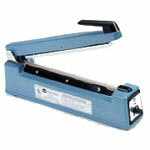 An impulse sealer will seal a bag 6 mil in thickness. For higher production a continuous band sealer is an excellent choice. Call Boatman Marking if you have any questions about which bag sealer is right for you.